Went up Mount Roberts today–the view is gorgeous though a little surreal: because I went up on the tram I didn't have that feeling of pain-earned and endorphin-fueled accomplishment one usually gets from climbing 1000 feet up that steep trail. 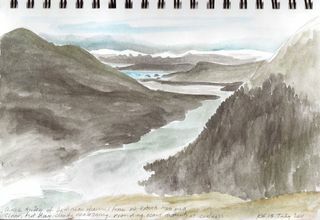 I had sketchbook and a variety of supplies; I wanted to do a very fast watercolor sketch (10 min) of the view down Gastineau Channel. Decided to play with the metallic watercolors, which I hadn't done in a while. I like the earthiness of them. When it came time to add the human elements in the lower left (bridge, harbor, town), I totally lost interest…Ah well.